There are three forms of visual art: Painting is art to look at, sculpture is art you can walk around, and architecture is art you can walk through. — Dan Rice, American entertainer. ‘For Those in Peril on the Sea’ by British artist Hew Locke, installed at the nave of the Church of St Mary & St Eanswythe in Folkestone. Locke’s exuberant and large-scale installation consisted of around 100 model ships – warships, trawlers, steamers, liners, brigs, rafts, junks – collected from around the world as well as made in his studio out of cardboard. Referring to sea trade and migration, the eclectic fleet was suspended from the nave of St Mary and St Eanswythe’s Church, The Bayle, the oldest building in Folkestone. Locke uses a wide range of media and makes extensive use of found objects and collage. He has a special interest in working around sites and ideas with a historical resonance, and has cited architecture ranging from the Baroque, Rajput, Islamic, and Caribbean vernacular to Victorian funfairs as influences. Recurrent themes and imagery include visual expressions of power, trophies, globalisation, movement of peoples, the creation of cultures, ships and boats, and packaging. 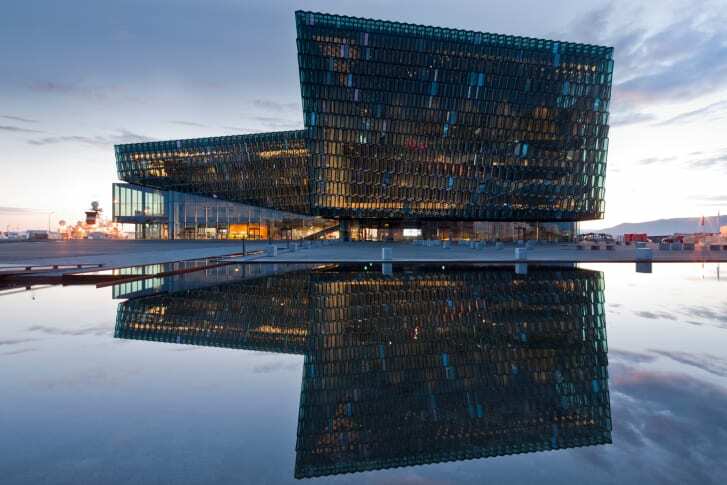 Harpa was designed by the Danish firm Henning Larsen Architects in co-operation with Danish–Icelandic artist Olafur Eliasson. The structure consists of a steel framework clad with geometric shaped glass panels of different colours. The development was intended to include a 400-room hotel, luxury apartments, retail units, restaurants, a car park and the new headquarters of Icelandic bank Landsbanki. As of 2015, apart from Harpa, only the hotel looked likely actually to be built. For several years it was the only construction project in existence in Iceland. The building was given its name on the Day of Icelandic Music on 11 December 2009, prior to which it was called The Reykjavík Concert Hall and Conference Centre . The building is the first purpose-built concert hall in Reykjavík and it was developed in consultation with artistic advisor Vladimir Ashkenazy and international consultant Jasper Parrott of HarrisonParrott. It houses the Iceland Symphony Orchestra and the offices of The Icelandic Opera. 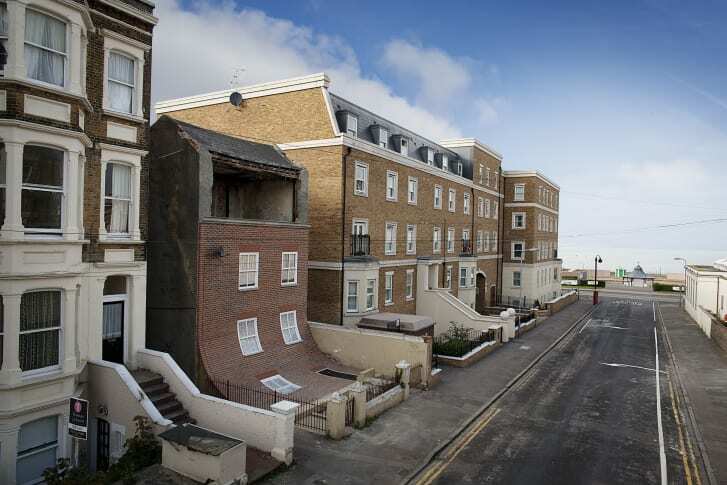 The “Sliding House” by artist Alex Chinneck, known for his playful experiments with the perception of architecture. Despite the fundamental functions that architecture must perform, the best examples continue to inspire artists across all genres with their masterful use of space, harmony and proportion. This house has become a treasured feature of a seaside town after an artist transformed it into a unique art by making it look like the facade has slipped into the front garden. Part of the upper floor of the four-storey property is exposed as curving bricks, windows and a door below give the illusion that the front of the house is sliding away. Ten companies donated their materials, manufacturing capabilities and professional services to build the sliding facade in Godwin Road in the Cliftonville area of the resort. ← Antilla -Most insensitive house ever built.